The Porta Rainbow is a non-folding paediatric wheelchair for children aged between 4 and 11 years. The Porta Rainbow is highly manoeuvrable with a fixed basket, integral oxygen cylinder holder and handles to secure the child whilst in transit. 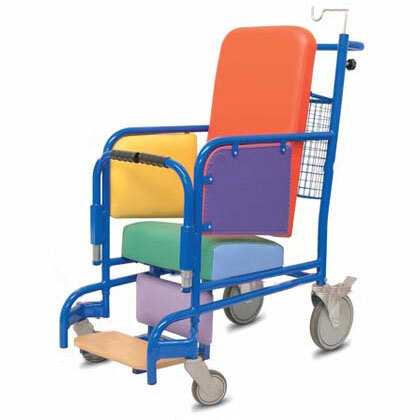 Its multi-coloured upholstery will uplift childrens wards with its bright colours. The robust non-folding construction of the wheelchair may alleviate the growing problem of unauthorised removal from your premises, as they do not fit in to the boot of many cars.